Recently, a research team led by Prof. CHEN Qing-An from the Dalian Institute of Chemical Physics (DICP) of the Chinese Academy of Sciences (CAS) developed biomimetic prenylation and reverse-prenylation of indoles with isoprene. Their findings were published in Angew. Chem. Int. Ed..
Prenylation and reverse-prenylation are ubiquitous processes common to almost all living organisms. These reactions incorporate prenyl and reverse-prenyl moieties into various natural products with promising biological properties (e.g. indole alkaloids). Nature employs dimethylallyl pyrophosphate (DMAPP) and isopentenyl pyrophosphate (IPP) as starting materials for the biosynthesis of these molecules via enzyme catalysis. Besides, DMAPP and IPP are also precursors of isoprene emission in plants. Intrigued by these biological processes, the researchers envisioned that isoprene may serve as a promising building block to install prenyl and reverse-prenyl groups on indoles via metal-hydride (M-H) catalysis. This proposal was challenging, because the unbiased isoprene was difficult to form active metal π-allyl intermediate and the four alkenyl carbons of isoprene were electronically undifferentiated, resulting in six addition modes. Given indole also had three reactive sites (N, C2, C3), the reaction could theoretically generate 18 possible regioisomers. Therefore, the selective formation of C3 reverse-prenylated and prenylated indoles was a daunting task. This goal was realized by the choice of M-H. Reverse-prenylated indoles were attained with high selectivity using Rh–H. 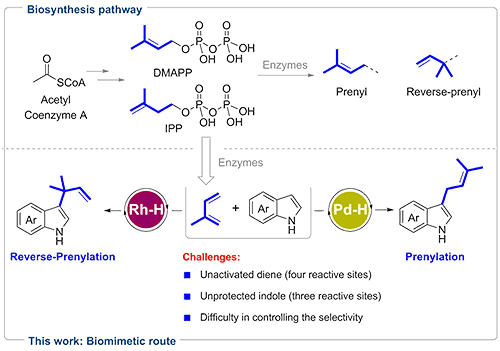 By switching to a Pd–H catalyst, selectivity toward prenylated indoles was achieved.